Board Members in attendance were: Judy Hammond, Nancy Brown, Glenn Jones, Jerry Martin, Rob Stark, Ralph Gresham, and Hope Feiner. Board Members absent: Rob Frits, Jamey Smithson, and Tommy Hensen. Also in attendance were Alicia Hines, Treasurer; John Duke, Property Manager; and Matt Baker; ARC. The meeting was called to order at 6:33 p.m. by Vice-President, Judy Hammond..
New board members are normally not seated until the July meeting of the year in which they are elected, but Ralph Gresham moved, seconded by Jerry Martin that Hope be seated as a member tonight due to the shortage of members present. The motion passed 4-1. Declaration of Quorum: Vice-President Judy Hammond presiding. Four (4) heavy duty portable picnic tables, two (2) to be placed in Founder’s Park, one (1) to be placed in the newly sodded area in Ross Park across from the swimming pool, and one (1) to be placed in the grassy area adjacent to the swimming pool and parking area. The estimated cost for the picnic tables is $800 each for a total of $3,200. Two (2) additional park benches to replace the two metal benches in front of the pool house. When Dr. Manning donated the metal benches I told him that we would install them along the brick walkway in the vicinity of his new building. I have heard some complaints about the metal benches being too hot when the sun is shining on them. Anyway, the new benches will be the same composite material as the other benches we have installed recently and should not absorb the heat as bad as the metal ones. The estimated cost of the benches is $750 each for a total of $1,500. Three additional park benches to be placed on the south and west side of the lakes near the commercial area. Due to the long delay in getting the concrete pads poured for the previously approved and purchased benches, John and I asked the concrete contractor to pour three additional pads for the future benches. The pads are there and ready for the benches! The plan is to ask some of the commercial businesses to contribute $500 in exchange for having their company name on a bench. This would reduce our cost from $750 per bench to $250 per bench for a total of $750. In addition to the picnic tables and benches, I am going to propose that we appropriate money now to plant additional trees this coming fall. We planted 30+ trees this past spring and I have heard a lot of favorable comments about them. I would like to propose that we plan on planting another 30 to 50 trees this fall. If the trees cost $125 each, this would mean an appropriation of $4,000 to $6,250. I think we should approve the funding now to be sure the trees are available when the time comes to plant. I look forward to seeing each of you at the meeting. If you have any questions please do not hesitate to contact me. After some lengthy discussion, it was decided that John Duke contact some businesses to ask for donations of $500.00. 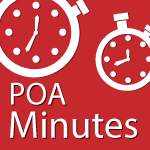 The POA will absorb the additional $250.00 per bench. Jerry Martin moved, seconded by Rob Stark that we purchase the picnic tables and benches listed in the bulleted items above for a total of $5450.00. Jerry Martin moved, seconded by Ralph Gresham that we authorize the purchase of 30-50 trees of up to $6250.00 to be planted in common areas in the Fall. The motion passed 5-1. Secretary’s Report: presented by Nancy Brown. The minutes for April 2013 were emailed in advance to board members for their review. There was no board meeting in May due to the annual picnic in the park. Jerry Martin moved to approve the April minutes, seconded by Glenn Jones. The motion passed 6-0. Treasurer’s Report: presented by Alicia Hines. The financial reports were emailed prior to the meeting for board members review along with the follow email. the finance committee earlier in the week. is why I have expensed them. Jerry Martin moved, seconded by Rob Stark to approve the April/May Financials. The motion passed 6-0. Property Manager’s Report: presented by John Duke. iii.Metro Paint-did not submit bid or return calls. Nancy Brown moved, seconded by Glenn Jones to hire CertaPro to paint the bridges. The motion passed 6-0. The bridges on Founder’s Park and Coyote Crossing are on the list to be painted by the city. 2.Wireless Internet Update-Pool House-almost any day now. 3.Crumpacker Park Memorial Discussion- John Duke met with Carol who may donate up to $15,000. Discussed possibilities of what should be constructed. Handouts are attached to these minutes. Discussion tabled until next meeting. Sod Bare Areas North of Pool House- first application of lime was spread on June 12, 2013. Scott’s recommends two applications in 2013 in order to improve the Ph balance. They will monitor the progress to determine 2014 applications. Dale Cramer is doing the work. Resident Tree Replacement- 30-40 trees that need replacements. John Duke is sending letters to the residents. New bridge planks need sealing-previously approved. $700. for both bridges. Juan Rodriguez Landscaping is doing the work. Brick Paver Repair on Founder’s Park East- $450. /within John’s limit to authorize repairs. Concert in the Park Discussion – Ralph Gresham moved, seconded by Jerry Martin to authorize up to $500. to pay for a band for live entertainment in Founder’s Park. The motion passed 6-0. Street Light Repair at WRMC – an electric line at WRMC involving one of the green post street lights has been cut since Christmas. John Duke got two bids to repair it. It involves cutting the concrete to get to the line. WRMC has verbally offered to split the cost. We are waiting on an official commitment from WRMC. Jerry Martin moved, seconded by Glenn Jones to commit to 1/2 of the cost for bid #2. The motion passed 6-0. Kids Pool – some blue tiles are coming off. Krystal Klear is able to fix it, but it will be an additional cost to the normal maintenance. The owners of a house on Zan Loop have painted their fence black, along with their neighbors fence without ARC approval. John Duke has advised them of the violation and they need to contact the ARC. Bike Racks – ongoing with Razorback Ironworks. ARC – presented by Judy Hammond. 6514 Norman– the new resident placed a large shop building on the back of his lot. He did not submit an application. It was not in compliance and the ARC asked that the building be removed. We did hold a special ARC meeting in regards to this matter and asked legal counsel to send a letter to the resident. The building has been removed. If you have any questions or need more information, please email me. Security and Neighborhood Watch – presented by Officer Scott. 3 Minors were caught breaking into cars on Founder’s Park. They were arrested. Fishing – several non-residents were caught fishing and were kicked off HBM property. Officer Scott reminded everyone when contacting the non-emergency PD dispatch number to report fishing by suspected non-residents, to state they are trespassing – the fish are property of HBM POA. Lakes Report – reported by Ralph Gresham. According to the National Weather Service, the drought is 7% worse nationwide this year and is moving in our direction, even though we had heavy rains this Spring. Therefore, there is concern for our lakes and we should make an effort for water conservation. The circulation pump is running only part-time and the well pump runs only from 8 p.m. to 7 a.m.
Wind is blowing water onto the grassy areas from the fountain at the Hwy 412 entrance to HBM. We need to have All Around reposition the fountain further south in the lake to avoid the waste. Ralph needs resident volunteers to help get growing algae out of the lakes. He is asking volunteers to meet this Saturday at 7:00 a.m. with rakes to help. Roots are getting into the dam areas and need vegetation killer applied. All Around needs to also clear brush from the dams. Yard of the Month – presented by Glenn Jones. Glenn reported that our Yard of the Month sign was stolen from Steve Lisle’s yard. It has not been located and we need to get a new one. 56th Street – Jerry Martin has the plans. Rob Stark has offered to help. Voted online in June 2013 to contract with Hog Wild Pyro for our 4th of July Fireworks Show. The vote was unanimous. A copy of the contract is attached to these minutes. With no further business, the meeting was adjourned at 8:50 p.m..
Respectfully submitted this 22nd day of July 2013.